Clean Clean CLean and move-in ready 2 bedroom, 2 bath villa-style end unit condo located in a beautiful park-like community with hundreds of trees and flora. Light and bright, tiled throughout, galley-style kitchen with pass through to dining area, living room w/vaulted ceiling, spacious master bedroom with full wall closet and master bath, enclosed lanai overlooking a greenbelt, brand-new washer & dryer,attic for storage and an exterior/attached shed, carport; shingle roof was replaced approximately 6 years ago (tear-off), exterior painted in 2011- cost of roofing and exterior painting was covered by the association. Village Gardens is a fabulous, friendly community with every-other week happy hour & pot luck; clubhouse has a library with a pool table, kitchen for catering, and on-site property manager. Heated pool has a ramada with 2 gas grills for picnics; a tennis court that doubles as a pickle-ball court. 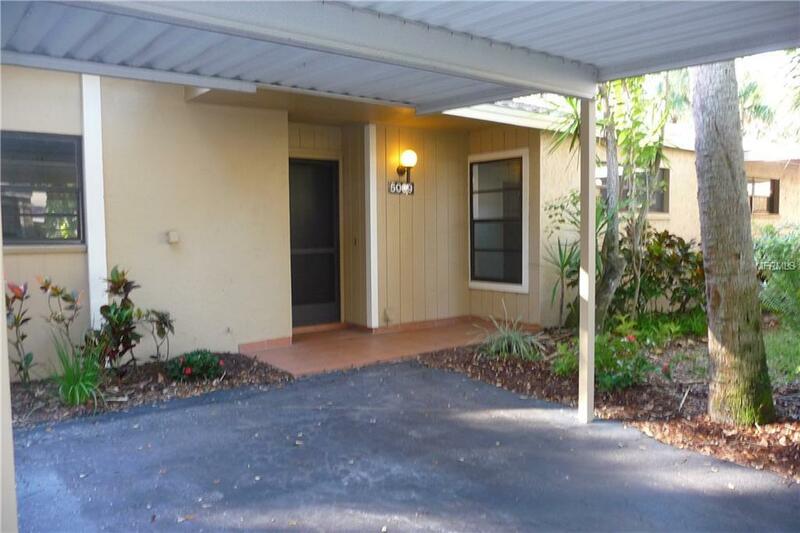 Located jus 12 minutes to downtown Sarasota. Dreaming of a home in paradise? Don't just dream a dream- BUY ONE!